Get Your Best Sleep Ever! Traditional foam earplugs use passive attenuation to reduce the sound entering the ear. Whilst they are good at blocking high frequency sounds, they are quite poor at reducing low frequency sounds, especially those below 500 Hz. The most common reason married couples sleep in separate rooms is due to the fact that one partner snores. 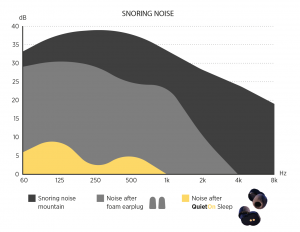 Snoring impacts 25% of people in the U.S. on a regular basis and over 50% on an occasional basis. Cancel out the sound of snoring partner with QuietOn Sleep and enjoy the sleep next to your loved one. Someone’s bliss can be another’s annoyance. 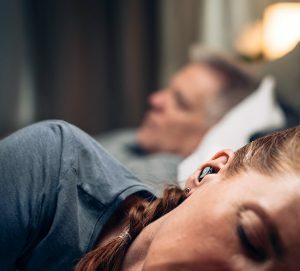 Loud music from neighbours’ parties, lawn mower’s sound in early morning, train clanging from nearby traffic, airplane landing… There are millions of reasons to wake us up in the middle of a good night sleep. 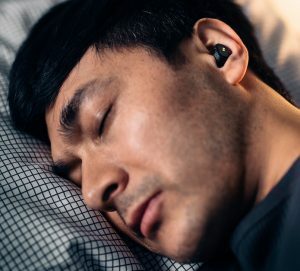 Shut out the external noise with QuietOn Sleep and enjoy the warm cosiness of your own bed.